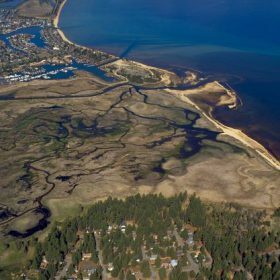 South Lake Tahoe, Calif. – September 13, 2018 – The California Department of Fish and Wildlife has awarded $1,700,066 to the California Tahoe Conservancy (Conservancy) to help fund the restoration of the Upper Truckee Marsh, the largest remaining wetland in the Sierra Nevada. Development in the last century destroyed half of the Upper Truckee Marsh and left the Upper Truckee River channelized near its mouth at Lake Tahoe. Today, the river delivers more fine sediment to Lake Tahoe than any other tributary in the Basin, jeopardizing the Lake’s famed clarity. Through the Upper Truckee Marsh Restoration project, the Conservancy will redirect the Upper Truckee River to its historic network of channels through the Marsh. Water flowing through the Marsh will slow down, allowing sediment to settle instead of reaching Lake Tahoe. The Conservancy will begin construction on the $9 million Upper Truckee Marsh restoration project in 2019. Additional benefits from the restoration project include better pedestrian access to Lake Tahoe and improved habitat for a diverse range of wildlife. The restoration effort will also make the Marsh and surrounding communities more resilient to droughts and floods, which scientists expect to become more frequent and intense because of climate change. The Marsh’s restoration will anchor a larger restoration strategy for the Upper Truckee River watershed, which the Conservancy has begun planning with partners. The partners’ goals include restoring the ecological integrity of the river, wetlands, and forests, while reducing wildfire risk and improving recreation access. Established in 1984, the mission of the California Tahoe Conservancy is to lead California’s efforts to restore and enhance the extraordinary natural and recreational resources of the Lake Tahoe Basin. For more information, visit https://tahoe.ca.gov.